It was my last day in LA, at the tail end of my round the world trip, and I woke up at 6am in a hostel in Santa Monica. The jet lag was insistent. I knew rolling over wouldn’t do me any good, so I heaved my carcass out of the top bunk, dressed silently, and headed out to face the day, or as much of it as was currently awake. There was one girl in the hostel lounge, working on her laptop. I asked her where she was jet-lagged from. Central America, she said. She turned out to be Catherine Shehadie, from Oz, and I turned out to be Tom Tyrrell from Britain. She was a curly-haired girl with mirror-bright blue eyes, and we hit it off – I’d been a sucker for bright eyes all trip. We discovered we were both flying home that day, albeit in opposite directions, and we had the morning spare. We decided to hang out. December in LA didn’t feel a lot different from the New Zealand spring I’d been running around in for the last few months – at least, until night slammed down at 4pm and the cold winds blew in. Typically, it was the hottest it had been all week, and I was stuck in trousers and walking boots, and my swimming trunks and towel were all packed away till I got home. 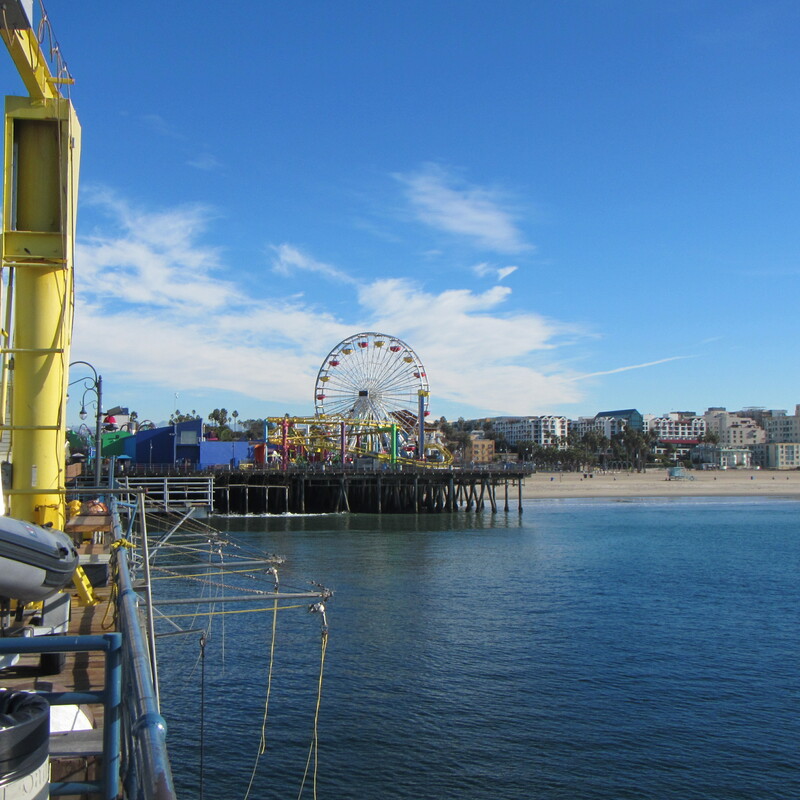 Instead, we walked along Santa Monica pier, then nipped down to the beachfront. 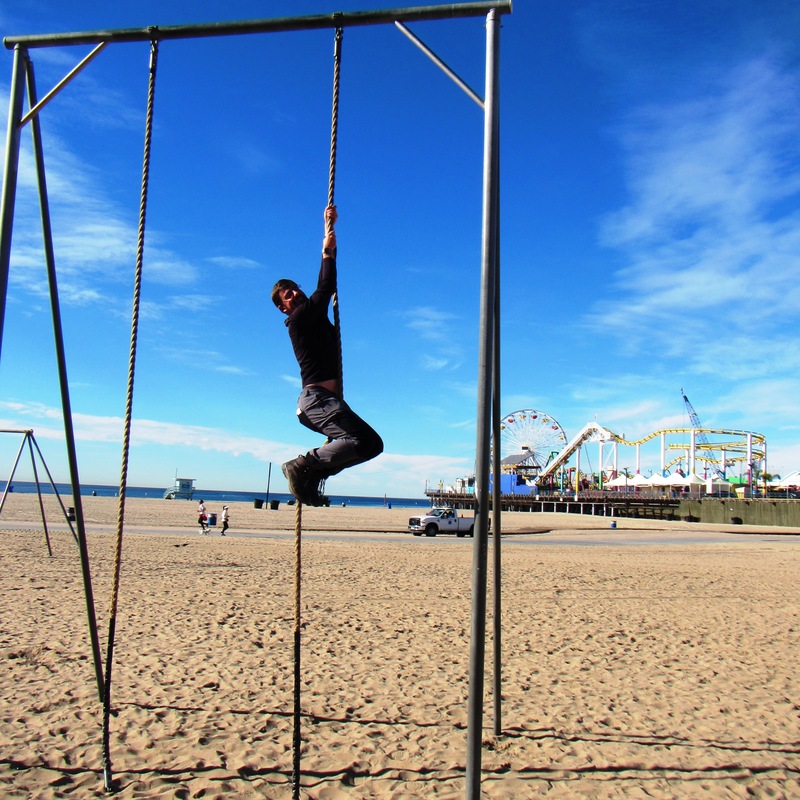 I hadn’t expected much from Muscle Beach, but it had turned out to be a highlight. Instead of over-inflated bodybuilders pumping iron, what you mostly saw were young wiry people swinging down these massive arcades of rings, like Lara Croft or the Prince of Persia in the video games, doing things you never expected to see in reality. To amuse Catherine, I made it most of the way up a rope and swung from a few of the rings – which was easier than it looked, if you didn’t mind looking like a sack of potatoes. Down the beach was a film crew, filming Pawn Sacrifice with Live Schreiber – or so we were told by a bit part player, an older guy named Pierce, who was looking unpleasantly warm in his 60’s three-piece suit. He handed a couple of the bottles of water they were giving out to the crew, and told us his Tobey Maguire story. It was evidently a well-polished Hollywood tale, but it amused the hell out of us. “I was doing a Stand Up To Cancer advert with Tobey Maguire and about 500 extras.” he says. “We were all packed into this massive stadium and only a certain number of us can get paid, so I got in the line for that. I get to the front, and the first assistant director doesn’t even look up at me. He keeps his eyes on his notes and he barks ‘Name!’ Just like that.